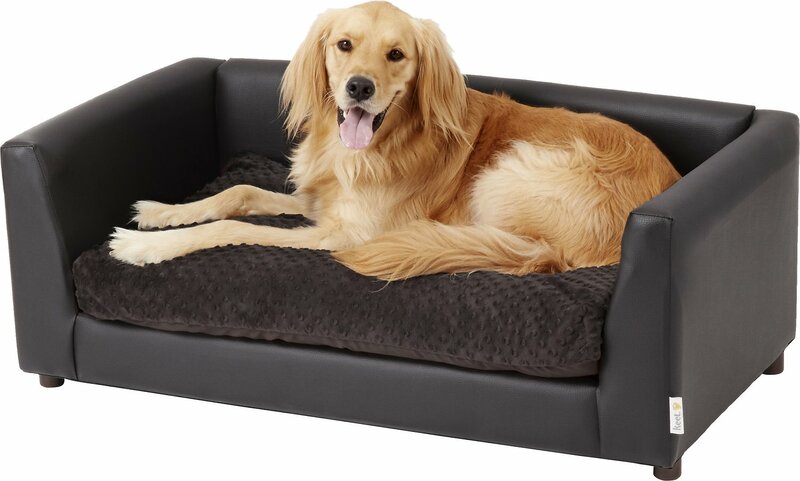 Make your canine companion feel extra important with this Keet Fluffly Deluxe Dog Bed Sofa. This Keet dog bed is upholstered with leatherette fabric and comes with a separate memory foam cushion covered in a soft mink-like fabric. 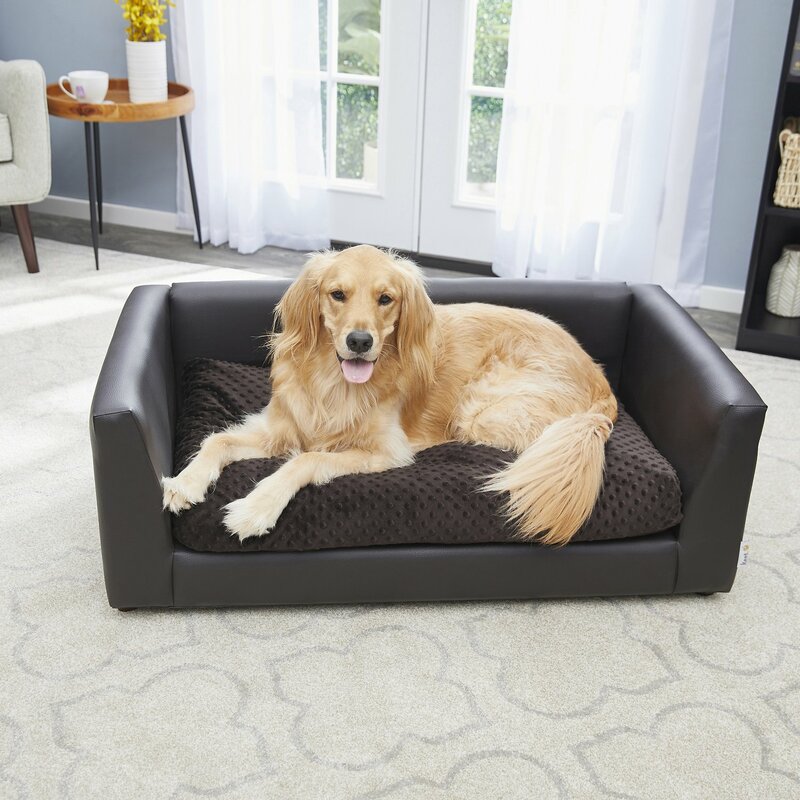 Now your furry friend can enjoy her own space on her new elegant sofa bed and feel like the important pup she is. Plus, it comes in three sizes for dogs up to 11 pounds, 15 pounds and 26 pounds and is also available in different colors, so you can choose the best color for your home and the best fit for your favorite pal! Hand-made out of strong wood frame and upholstered with leatherette fabric for elegant appearance. 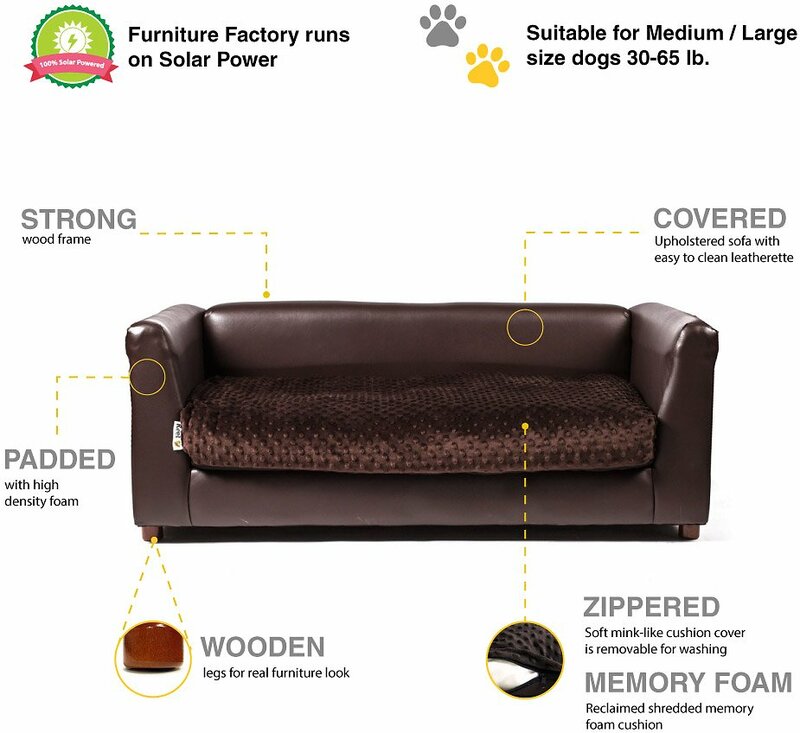 Comes with a reclaimed shredded memory foam cushion, covered with soft mink-like fabric that will keep your canine feeling extra cozy. Comes in 3 different sizes so canine companions of all sizes can enjoy the luxury of Keet. Zippered cushion cover is removable for washing, while the leatherette can be easily wiped down to help maintain the sofa bed's appearance. Elegant sofa bed is the perfect addition to any household and is available in more than one color. Cushion Care- Machine wash with warm water. He loves his bed.. I was a little nervous h might be to big or heavy for it but it actually is perfect for him.. he’s a very spoiled dog and he refuses to sleep on the floor he walk around all day so he has his own chair in the living room a foam bed in the bedroom but I’m the front room he was always sad because he loves to sleep on couches every since he was a baby but I got tired of cleaning my couch so I wouldn’t let him up there anymore so when I saw this bed that looks like I couch I had to get it and he barely ever sleeps on his other bed and chair now I find myself having to bring this one I’m the living room because he wants to lay on it but doesn’t want to leave my site! I really loved the couch just wish it was bigger in the large so my German shepherds would lay on it... they dont lay on it because it's not wide enough so they end up hanging off of it.. also needs a better cushion. So I think I'm going to go buy a thicker one so you the dogs dont feel the boards. Other than that it's good for the price. I ordered the small for my 11 lb Papillon mix. He fit in it but I felt like it was a little small. I asked if they had an exchange program and they don't but told me to donate it to a shelter or give to a friend and would give me a refund. Ordered the medium and I'm sure it will be just right. Their shipping is VERY fast also. I've had this product for a few months and it still looks brand new despite daily use. It arrived in one piece and appears to be decently made; the cushion is a nice touch. I purchased the dog couch about a month after my dog's acl surgery as she had difficulty getting on our couch and bed as usual; she seems to like it . My dog is about 12lbs and this is the medium couch. The pillow is no where even close to being “memory foam” as it states in the description, it’s a piece of fabric with minimal cotton stuffing in it. With that being said, when the bed is laid on, you can feel all of the wooden slats holding the bed together. This is extremely uncomfortable for my chocolate lab, he refuses to lie on it. I’d return it but it’s too big and I already discarded the box.